I found this story very interesting. Many years ago, a farmer who owned a farm land along the Atlantic Seacoast advertised for hired hands. Most people who needed work were reluctant to pick the job because it was close to the sea and there were often sea storms and they were afraid of the storms that often raged across the Atlantic, causing havoc on buildings, crops, animals and even human beings. Finally, one day a man came. During the interview the farmer asked him: “are you a good farm hand?” and the man said “Well, I can sleep when the wind is blowing and the storm is raging”! Although the Answer was not so clear for the farmer he employed him anyway as he needed a hand. And when he began to work the farmer was satisfied with him as he was devoted, diligent and conscientious. The farmer was furious with the man’s response and instantly decided to sack him the next day. In the meantime he went to prepare the farmhouse for the coming storm. When he came out he discovered to his amazement that every necessary preparation had been done by his worker even before the sign of a storm. The cows, chicken, crops and indeed everything had been well covered and safe from the storm. It was then that the farmer realized what the man meant when he said that he could sleep when the wind is blowing and the storm is ragging. He was simply prepared for the storm so he could sleep through it. Have you ever being taken unawares or being caught up unprepared on a normal account or on a not-so-good situation? It could be when you were not ready to do or say the right thing. The word prepare comes from the Latin praeparare which is a combination of two words: prae which means “before” and parare which means get ready. To prepare thus means to get ready before an action takes place. Other words and phrases that can describe PREPARE include: to draw up, assemble, provide, construct, compose, produce, arrange, develop, edit, devise, work out, think up, conceive, formulate, concoct, fashion, work up, lay, etc. Most virtues that are known to us have their origins in God. God is very fond of preparing right from the beginnings. Before creating animals and plants God prepared the land and the seas (Gen 1:10). Before the creation of man (and woman) God prepared the Garden of Eden (Gen.2:8-9). Before every divine action there is always a corresponding divine preparation. God prepared a ram for sacrifice in place of Isaac (Gen.22:13). Before the people of Israel left Egypt God used the Passover to prepare them (Exodus 12). Jeremiah was prepared by God for a mission before he was formed (Jer. 1:5). God prepared our redemption through the coming of our Lord Jesus Christ (John 3:17). Today we have the theme of preparation running prominently throughout the readings especially in the First Reading (Isaiah 40:1-5.9-11). And the Gospel Reading (Mark 1:1-8). In the First Reading, God told the prophet Isaiah to comfort His people and to assure them that the period of warfare has ended. This simply means that God is coming back to the people after a period of their separation from him. To this end, the prophet went further to tell the people to prepare for the God’s coming. The aforementioned preparation according to the oracle of the prophet is expected to take place in form of a road construction. In physical road construction, three important activities are premeditated: levelling, filling and making plain. Translated to spiritual life, similar activities are recommended. The road is our heart that is now marred by mountains and hills of sin and disobedience otherwise seen as obstacles; the road represents our hearts filled with valleys and potholes of absence of love, knowledge of God and other Christian virtues. This is also known as lacuna, The road presents our hearts made rough by the paths we have chosen that simply lead us away from God. The prophetic recommendation tells us to level the mountains and hills and that means pulling down frameworks of sin and disobedience in our lives. Like a typical mountain and hill they block us from seeing and reaching at God. Filling the valleys is a practical advice for us to bring back those virtues and values that should fill up the needful spaces in our lives. Making the rough edges plain is an invitation for us to remodel our lives and retrace our paths to God. After all these, the glory of the Lord will be shown forth and all the flesh shall see it together. It will be good to establish here that the spiritual road construction will take place before the glory of God will be shown forth to all flesh. It is really very painful that in our day and age many people seem to put Advent on hold while preparing to celebrate themselves (not Christ) at Christmas. The geometric rise in consumerism and extreme commercialisation of Christmas has become a commonplace in our times. Towards the end of the month of November, we begin to perceive sights and sounds of Christmas while Advent is totally neglected. We tend to anticipate the glory but only few are ready to undertake the spiritual road construction, many of us are seriously waiting to celebrate Christmas but only a few are ready to get there through the Advent. More like many of us prefer shortcuts to Christmas; that means avoiding or side tracking the Advent. The Gospel Reading is very much like the First Reading as the phenomenon of preparation still hold. However it is more concretely established with the idea of the baptism of repentance. In other words, John the Baptist challenges us to accept repentance as a very dependable way of preparing our hearts for the coming of the Lord. There will be a strong need for us to approach the sacrament of reconciliation this season. There will be need for us to reconsider our lifestyles, there will be need for us to advance for a positive change to make our hearts habitable for our Lord when he comes. In our world this period is marked by so much craving for material possession but John the Baptist herein recommends detachment from material wealth through his wardrobe and menu. We are told that he wore animal skin for clothing and for his diet he lived on locust and honey (one can observe that the things are not only unusual they are also rare). It is worthwhile to inquire why that aspect of his personality was added in the gospel as if what he wore or eat were very important to his message. In fact, they are not only important they are also part of the message. The recommendation is that we should be modest with material things this season. Often we get so much saturated and overwhelmed by material things that we have no time and space to prepare the way for the Lord. That was why our Lord would ask us not to worry about food or what we are to wear considering the life of helpless birds (Matt.6:25-26).. The Second Reading (2 Pet.3:8-14) tells us to assume the attitude of waiting but that will be after making the critical spiritual road construction. This form of waiting should not be based on our human way of reckoning time. God’s timing is quite different from our own timing. Often many people fix dates for the time of the coming of the Lord but they have also failed several times. 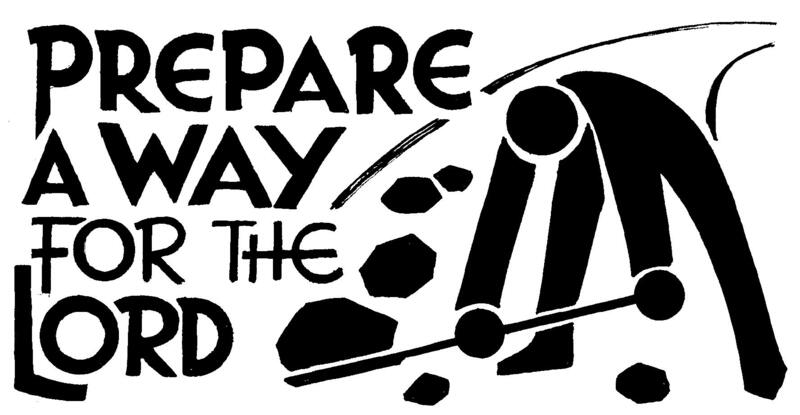 God expects us at this time to be concerned about preparing a way for Him. He is not coming to Bethlehem but into our hearts. For this reason and in this season, we are expected to devote our time and disposition to preparing the way for the Lord. The tomorrow we are expecting belongs to those who prepare for it today and let us also remember that when we fail to prepare we prepare to fail. Have a dependable Second Sunday of Advent and continue to PREPARE for the LORD.